Place the mango pieces in a blender and blitz until smooth (should make 1 cup mango purée). Pour mango purée into a bowl, add evaporated milk and stir to combine. In a small bowl, combine the hot water, sugar and gelatine. Add ice cubes to the mango. Pour the gelatine mixture into the mango mixture, keep stirring until the ice melts. Pour the strained mixture into 6 serving glasses, then chill for at least 3 hours. 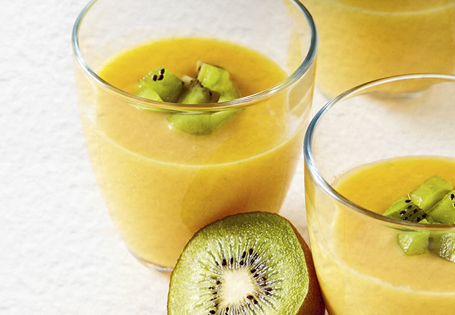 Before serving, garnish each pudding with diced kiwi fruit.